When Kel and I started planning our huge cross-country road trip for 2018, we started pondering the best way to safeguard our valuables in the truck. We’ll be traveling with plenty of gear (especially electronics like laptops, digital cameras, smartphones, our passports, and the like). Obviously, keeping everything in the glovebox isn’t a viable or secure solution. The Best Portable Travel Safe? So when I stumbled upon Pacsafe’s Travelsafe line of portable travel safes, I was overjoyed. The GII portable safe is sold in 5L or 12L varieties. While the smaller, more portable 5L caught our eye at first, we eventually settled on the 12L and we’re so glad we did. 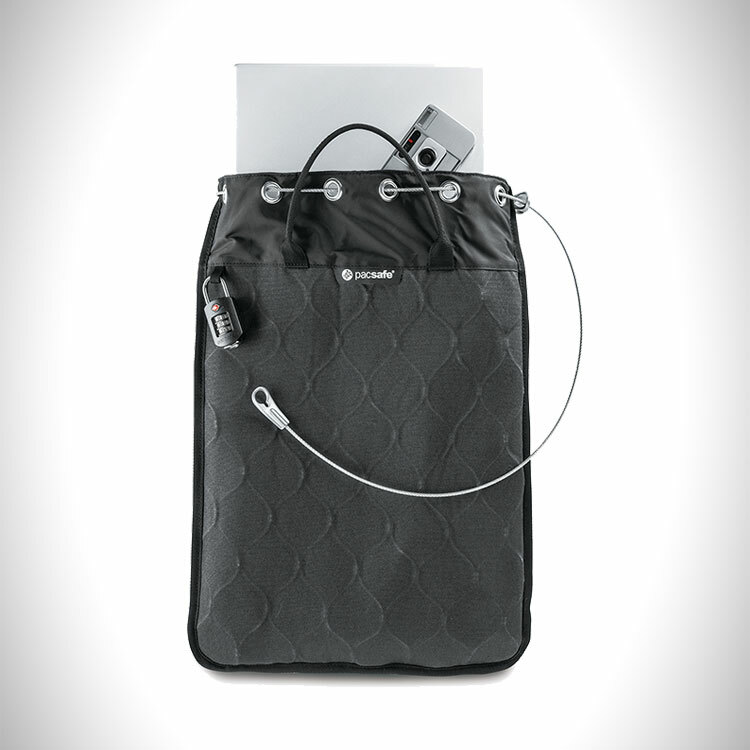 The Travelsafe portable safes are made with the same eXomesh design as most of Pacsafe’s goods. It’s essentially a steel webbing woven into the lining of the fabric that ensures no one will be able to “crack” it. The bag itself is virtually impenetrable — it takes much more than a pair of scissors or cutters. No opportunity thief (which is what most thieves are) is going to be packing the necessary equipment to cut into the Travelsafe. 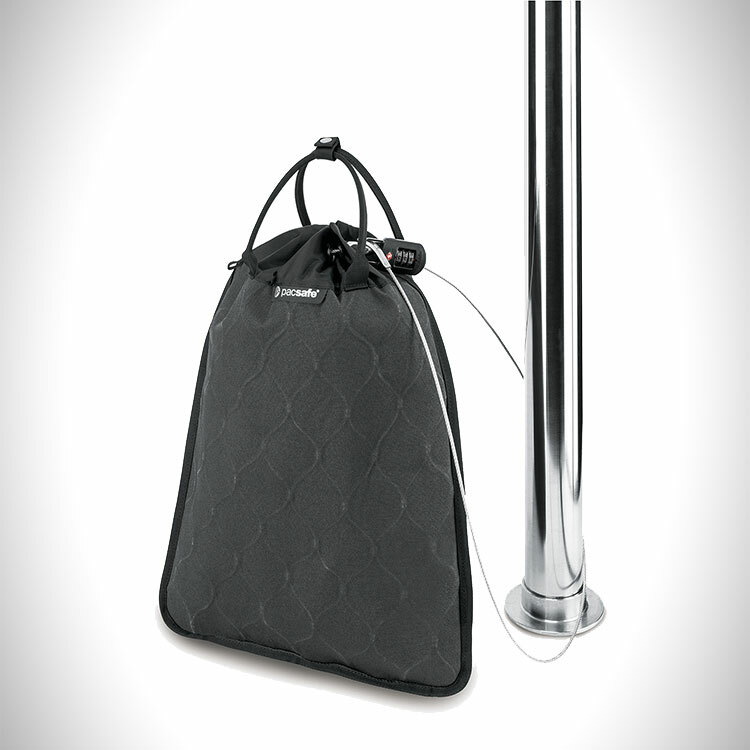 The Travelsafe accepts most standard TSA-approved locks and “deploying” it is simple. Stuff your valuables inside, cinch the top down as tight as possible, secure the included cable around something that would be virtually impossible to steal or break, and lock the cable to itself. The entire process takes less than a minute. For securing it in our truck, we like to use the U-brackets that are visible once folding the rear seats down flat. These are welded to the truck’s frame, so they’re virtually unbreakable. In a hotel room, any sturdy piece of furniture will do (a strong headboard, armoire, etc.) or my personal preference is to use the pipes under the bathroom sink. No thief in their right mind is going to pull too hard on these to try to steal your gear. It’s just not worth the potential mess. We’ve previously tried and loved Pacsafe’s secure luggage and camera bags. But, the Travelsafe 12L is an ideal insert for an existing bag or backpack. Or, it can serve as a standalone portable safe to keep safeguard goods in your car or hotel room. Sizewise, it’s capacious enough (20.5 x 13.8 x 0.5 inches to be exact) for a 15-inch Macbook. So, for our purposes, it’s more than large enough to fit our passports, two ultrabook laptops, wallets, and maybe some digital camera equipment to boot. It’s also super lightweight (around 1.5 pounds) and packs down quite flat — shoved into my carry-on, I hardly even notice it’s there. Other secondary, smartly designed features include carrying handles and an offset/lightly colored, soft brushed Polyester interior to protect and make finding your goods even easier. Available now in black for around $90 USD directly from Pacsafe or even less from Amazon. Nearly $90 USD may seem pricey for what appears to be “a foam bag with some built-in security wiring.” But, considering Pacsafe’s entire line — including the Travelsafe 12L — is damn near bulletproof, we think it’s well worth it for the peace of mind. The post This Clever Portable Travel Safe Keeps Your Valuables Safe on the Road appeared first on Vagabondish.